A friend of mine, a trusted 30+ year practicing doctor actually called Merck in 2010 to inquire re the placebo of the rotavirus vaccine. It was exactly the same ingredients as the vaccine group minus the attenuated virus. So how can this really be acceptable to determine side effects and effectiveness? Pediarix – German study: test group =Pediarix AND HIB versus control group = Infanrix, HIB AND OPV. The Hepatitis A Vaccination is recommended for all children age 12 months or older, for travelers to certain countries, and for people at high risk for infection with the virus. The hepatitis A vaccine is given as two shots, six months apart. All three vaccines prevent infections with HPV types 16 and 18, two high-risk HPVs that cause about 70% of cervical cancers and an even higher percentage of some of the otherHPV-associated cancers (9, 10). Gardasil also prevents infection with HPV types 6 and 11, which cause 90% of genital warts (17). The MMR vaccine is an immunization vaccine against measles, mumps, and rubella. It is a mixture of live attenuated viruses of the three diseases, administered via injection. The MMR is in wide controversy to be linked to the onset, or conclusion of toxic overload and autism symptoms in children. It was first developed by Maurice Hilleman while at Merck. Meningitis is an inflammation, swelling of the protective membranes covering the brain and spinal cord. A bacterial or viral infection of the fluid surrounding the brain and spinal cord usually causes the swelling. 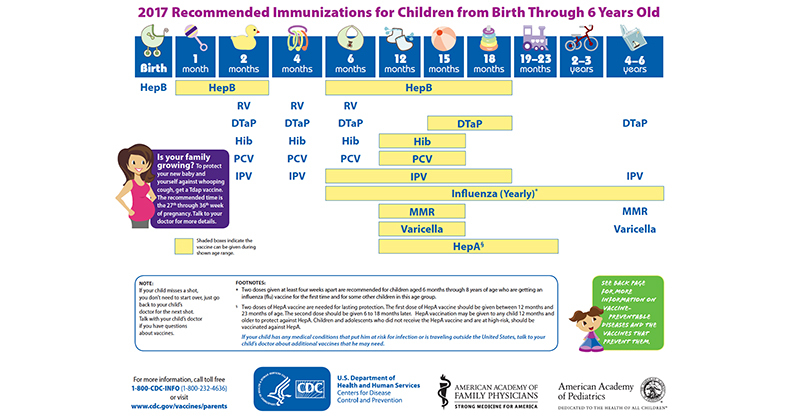 Pneumococcal conjugate vaccine is recommended for all babies and children younger than 2 years old, all adults 65 years or older, and people 2 through 64 years old with certain medical conditions. Polio, or poliomyelitis, is a crippling and potentially deadly infectious disease. … The virus spreads from person to person and can invade an infected person’s brain and spinal cord, causing paralysis (can’t move parts of the body). Tetanus is a serious bacterial infection that causes painful muscle spasms and can lead to death. Diphtheria is a serious infection of the nose and throat commonly a sheet of thick, gray matter covers the back of the throat, making breathing hard. Pertussis is a highly contagious respiratory tract infection commonly known as Whooping Cough, a cough that sounds like “whoop,” symptoms include a runny nose, nasal congestion, and sneezing. Tdap should be administered regardless of interval since last tetanus or diphtheria toxoid-containing vaccine (e.g., Td). After receiving Tdap, people should receive Td every 10 years for routine booster immunization against tetanus and diphtheria, according to previously published guidelines.